Last Game 2 | Manga Reviews ~ Ramblings of A Fob. Well this volume started off with the astronomy club on their way to Hisato’s villa so that they could observe the stars. But the tension between Hisato & Makoto is getting high well mainly just Hisato. He couldn’t stop thinking about the “accident” kiss on his cheeks when Makoto bumped into him one day at school. Last Game is still a fuzzy read. You just can’t help but to like the characters. I extremely enjoy reading about Hisato’s actions and his inner conflicts about his love for Mikoto. He is such a girlie guy that gives too much meaning in every little details that is happening around him and Mikoto. He puts color and meaning into everything, that he come across as an “innocent” guy. He is such a refreshing changed for the usual cool, badass, emotionless popular guy in the ever so cliche shojo genre. While some readers might be put off by Mikoto’s unbelievably oblivious knowledge about romance. She quite have this emotionless persona albeit adorable all at the same time. She really is a “different” case of Sawako you just can’t help compare this series to Kimi ni Todoke. The uncanny resemblance of the plot, the characters interactions and their feelings are all present in this series. As I mentioned, some readers might end up passing this series up since it’s hard to come to like something that seemed like a copycat of something you really enjoy. 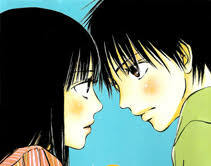 Last Game might have been inspired by Kimi ni Todoke but I still highly recommend this series as the it provides those “fuzzy” things and saccharine moments that will surely put a smile on your face. I have lots of things that I can nitpick on but I like this series so its forgiven. But come on Mikoto, a very bright girl but not so aware of what she is feeling. Like duh everyone or even pre-schooler kids know of LIKE and CRUSHES nowadays. She might not thinking about relationship wise but come on girl you could at least come up in terms that you LIKE Hisato more than just being friends. But whatever, this series just delves into that “woes” of Mikoto. It’s delightful and you just can’t help root for her to realize her feelings sooner. But yeah I’m a sucker of this kind of stories it’s such a way to give you a great mood. Oh I should mention that I’m liking Hotaru he’s the guy whose a year younger than Mikoto and Hisato that joined the Astronomy club in the first volume. He initially came across as a rival for Yanagi. His presence in this series is to cause some jealousy for Yanagi.. But then in this volume he might developed some feelings for Mikoto. I think he will come into terms that Mikoto only sees Yanagi (romantic aspect) so it’d be unrequited love. But he’s there to cause some jealousy and joy for us readers, after all a sappy love triangle is addicting. Unfortunately though I don’t think it will come into that. Its too light hearted.